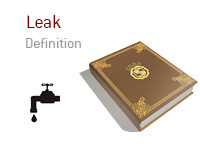 What does the term "leak" mean in the game of poker? What is the definition of the term "leak" in poker? A "leak" is a fundamental flaw that a player has that makes them a far less profitable player than they might be otherwise. For instance - a player who "set mines" regardless of the mathematics involved would be said to have a major "leak" in their game. "Set mining" (hoping to flop a set) makes sense only if the odds dictate it. For instance - let's say that you are playing in a $1/$2 cash game at your local casino. You are on the button in this hand. There is a raise from early position, and a re-raise from middle position. Both players are tight and aggressive. The action gets around to you on the button, and you look down at pocket Twos. Now, there is no chance that you are ahead in the hand at this point, and you have already seen a raise and a re-raise in front of you. Despite all of that, you decide to call, hoping that you hit a set on the flop. This is a major "leak", as there is no way that you should be calling here. What happens if the original raiser pushes all-in after you decide to call? What happens is the original raiser calls and the flop comes K-Q-J? This is just one example of a "leak" in poker - there are many different examples to choose from.